While I'm not currently in the baby raising mode, with four children, I went through that multiple times and I know that there are many potential expenses and also many more ways in which you can be frugal. Here are some tips to keep down the costs for your baby from a reader. According to a report from the USDA, the average middle-income family with kids will spend between $12,000 and $14,000 annually on child-related expenses. Babies aren’t cheap, we all know that. But there are a few things you can do to lessen the burden so that you’re not struggling to make ends meet when baby arrives. In this guide, we’ll help you determine how much you need to raise baby in her first year and provide you with some useful tips you can employ throughout baby’s life to help make your dollars go further on baby clothes, food, diapers and more. Keep in mind, a good majority of things you need for the baby stage will come from friends and family, either through shower gifts, hand-me-downs or pure generosity. This budget assumes that you’ll receive zero gifts in baby’s first year, which won’t be the case for most people. But it’s better to budget conservatively so that you have some dough left over for emergencies. These numbers come from the USDA’s Cost of Raising a Baby Calculator and account for a single child under 12 months old living in a two-parent household. For more accurate results based on your situation, put your information into the calculator. Clothing: $1,000: On average, most families spend roughly $1,000 annually on baby clothing in baby’s first year. Clothing costs include apparel, diapers and shoes. Note that many people reduce spending on clothing during baby’s first year due to gifts. Food: $2,000: Besides housing and childcare or education, food will be the most expensive supply for kids throughout their lives, with most families spending about $2,000 annually on food per child. Childcare: $3,600: With childcare ringing up for around $300 per month on average, parents can expect to funnel a good majority of their budget into daycare, nannies or babysitters. Health Care: $1,500: A child’s health care costs will vary drastically based on whether or not you have insurance and where you live. In the U.S., most families will spend about $1,500 per child on medical and dental services not covered by insurance. Housing: $4,600: Housing is the most expensive bill for middle-income families, with families spending $4,600 annually to house one child. Note that housing costs also include furniture for the nursery. Other: $1,000: Some child-related expenses don’t fall into any category above. Other expenses might include personal care items, entertainment, accessories and books. 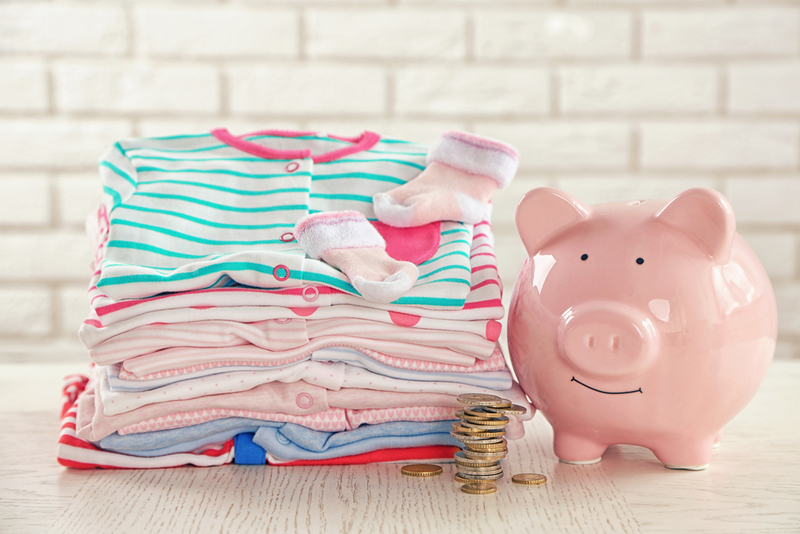 There’s no denying that you’ll need some funds to raise kids, but there are some ways you can get those average costs down so that you’re still giving your family everything it needs without sinking in your entire life savings. Be Smart with Clothes—The key to buying cost-effective baby clothing isn’t to buy whatever’s cheapest. It’s to buy high-quality yet affordable staples, like 100 percent cotton bodysuits that are durable enough so they hold up through dozens of washes, accidents, spills and messes. If possible, buy fewer high-quality items and focus on reusing as much as you can. Spend some time thinking about what you need to buy new and what you can get used and try to spend your new clothing budget on long-lasting, versatile essentials, like cotton Onesies®. When Possible, Buy Used—Having a stash of brand-new basics like cotton bodysuits is a good approach for most days, but for pants, sweaters, dresses, rompers and shoes—not to mention car seats, nursery furniture and toys—go on a treasure hunt at the local second-hand baby store. And don’t be afraid to inquire with friends and family about hand-me-downs. Buying used and accepting second-hand items can save you thousands in the long-run, especially in the first couple of years. 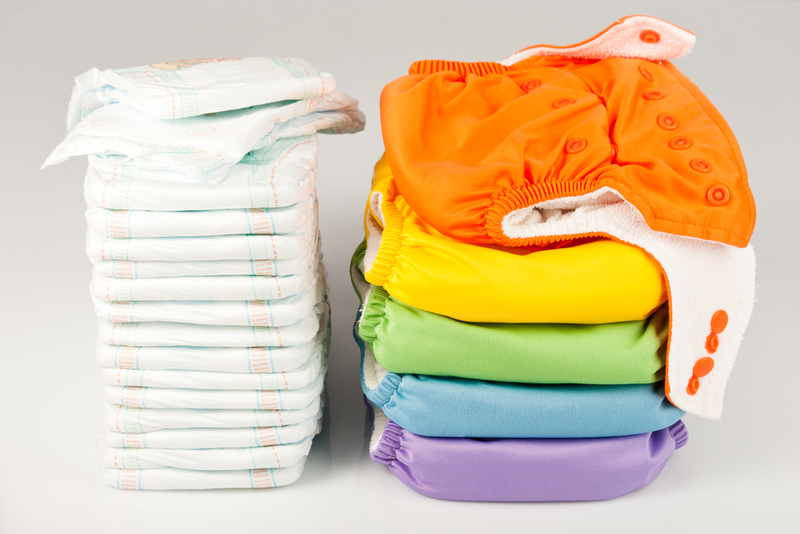 Consider Cloth Diapers—Cloth diapers have come quite a long way since the days of safety-pinned white cloth! These days, you can find easy-to-use all-in-one cloth diapers that make cloth diapering amazingly simple and clean. And, as you can imagine, ditching the costly, single-use diapers in favor of reusable styles can save you big bucks, with a full cloth system costing as little as $300 up-front compared to a lifetime cost of as much as $2,500 for disposables. Make Your Own Baby Food—Like cloth diapering, making your own baby food seems daunting but is actually relatively simple and a great way to save some dough. Homemade baby food costs a third of the price of commercial, store-bought jars of baby food, bringing a savings of nearly $400 a year. If you think that the cooking, jarring and taking-on-the-go aspect of making food at home is too much hassle, you’ll be happy to know that there are dozens of unique new products on the market to combat these problems, like baby food processors and steamers and reusable baby food containers. Look for Ways to Save on Childcare—Childcare is one of a parent’s largest kid-related bills, and it’s certainly not somewhere you want to skimp. Never underestimate the value of having your child somewhere safe with someone you trust. With that said, there are a few great ways to save on childcare or recoup some losses, like taking childcare tax breaks and credits, using home-based daycares instead of commercial preschools or working out babysitting trade-offs and deals with friends who also have kids. Preparing for a new baby comes with a whole lot of spending, and it’s like anything else in life. You can splurge on the flashy, fancy and high-tech—and if it makes your life easier or makes you feel safer, then it may be worth the spend—or you can keep things as minimal as possible and focus on saving. At the end of the day, it doesn’t matter how you spend your money as long as your little one has the necessities and love she needs to thrive from babyhood to adulthood!